What is Splish Splash Bash? Splish Splash Bash is a fundraiser for Community of Hope Ministries. The fundraiser is a pool jail-a-thon. Our favorite politicians, business, and civic leaders volunteer to be arrested on the afternoon of the event. The “jail” where they are held will be in the field next to the Chick-fil-A in Garner Towne Square. 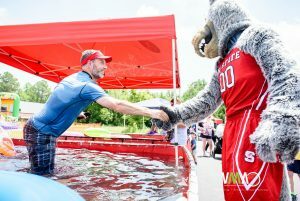 In order to make “bail”/get out of the pool – they must raise $1000.00. Their friends and co-workers have a great time visiting them in jail. It is a very fun day! What will my money support if I choose to donate? 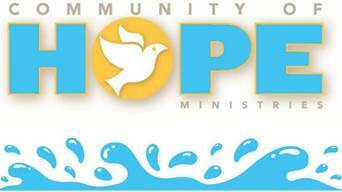 Your donation to the Community of Hope Ministries’ Splish Splash Bash fundraiser will support the addition of a brand new walk-in cooler and walk in freezer for the Community of Hope food pantry. This additional space will allow Community of Hope to significantly increase the amount of fresh fruit and produce we currently distribute through our existing programs. We currently have three commercial refrigerators. There is not enough cold storage to maintain and protect the freshness of the produce to which we have access including the bounty of produce that we grow and harvest in the Garden of Hope. Simply put, Community of Hope has been limited on the fresh options we offer because we do not have adequate cold storage. Every child (80) in our afterschool program and his/her family (we estimate 2.5 children in every home) receives a 60 pound box of non-perishable food items twice per month. We add fresh vegetables whenever possible. Campers on scholarship in our summer camp and track out program also receive boxes of food. Community of Hope prepares hot lunches and two snacks daily during our summer camp and track out programs. Snacks are prepared daily for ALL of our children in our after school program. Community of Hope is the sole sponsor of a pilot program for a food pantry at Garner Magnet High School. In summer 2018, Community of Hope will be a summer feeding site for children who are home for the summer but who traditionally receive free breakfast and lunch while in class during the school year. Our existing food pantry reached 2,689 different families last year. 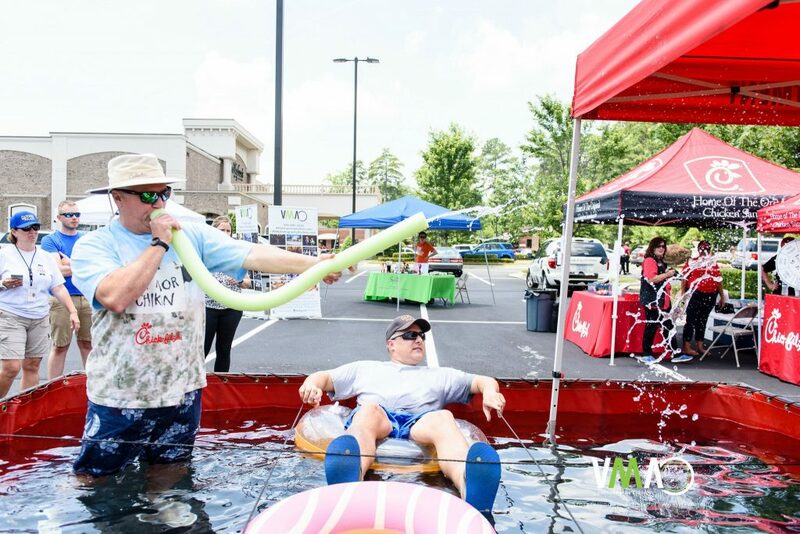 Community of Hope has four sponsorship levels available for this day-long event ($500.00, $750.00, $1000.00, $2500.00) The day begins at 11 AM with a food drive in the Chick fil A Drive through at the Garner Towne Square location. Participants who bring at least 5 cans or donate $5.00 to receive a free Chick-fil- A Original Chicken Sandwich. Splish Splash Bash, the Community of Hope fundraiser, will operate from 1 pm – 4 pm. All funds donated at the drive through on that day will support the addition of the brand new walk in cooler and freezer at the Community of Hope food pantry. Community of Hope is a 501(c)(3) non-profit and your donation is tax deductible. If you or your company choose to support us at one of the four sponsor levels or at a level of your choosing, you will receive a letter for your tax records certifying that no goods or services were received as a result of the donation. Because this campaign will support a permanent structure, if you so choose your company name will be included in permanent signage at the food pantry recognizing your contribution at the $1000.00 level and above. Use the button below to donate to Splish Splash Bash and help save an "inmate" from pool jail!